If you listen to the most intelligent talk radio show in the morning, the Hugh Hewitt Show, Hugh will always open up his show by saying "Morning Glory, and for those calling in to wish Hugh a good "morning glory", Hugh will respond with "Evening Grace." 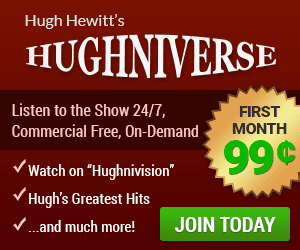 I am doing this repeat post from April 5, 2016 when Hugh began his show in the mornings [switching from when he did the shows in the late afternoon] in asking you to consider getting a membership [at a reasonable price] from the Hughniverse web site. Not only can you listen to any podcast of any Hugh Hewitt show that you miss, there is much more to the Hughniverse than that. There is a private chat room of Hughniverse members only where you can not only chat during the show but see video of Hugh doing the show. Also, Hugh Hewitt's loyal radio producer, Duane Patterson, does a really excellent and entertaining Aftershow most weekdays from 7-8:30 pm Central Time. On Friday's many times the great humorist blogger/writer/columnist from Minnesota James Lileks will drop in the Hughniverse Aftershow to join Duane and those in the chat room for some really funny banter between Duane and James. Also in the Hughniverse you can access Duane FM where Duane Patterson and "tribble" Michael Patrick Tracey play some of your favorite music. UPDATE: A short time after I published this post from a couple of years ago, Hugh Hewitt became an official political analyst for NBC/MSNBC News and then a short time after that, Hugh received his own television show on MSNBC on Saturday mornings at 7 am CT [or as I like to call it, World Champion Houston Astros time]. While I am asking that you consider joining the Hughniverse in this post, I also ask you to consider watching the Hugh Hewitt television show on Saturday mornings on MSNBC - it is really a great informative show. Thank you.